A Derbyshire man is undertaking the ultimate American road trip as he travels over 3400 miles for the Motorcycle Cannonball 2016. Pushing himself and his vehicle to the limit, 66-year-old Mike Wild will be racing a 1910 Triumph motorbike from New Jersey to San Diego, raising money for Autism Awareness UK. Meeting strict 100-year-old motorbike entry criteria for this year’s Century Race, Mike will average around 300 miles per day from Saturday, September 10 to Sunday, September 26. “The race will be a huge adventure with many challenges that will test my knowledge, general fitness and experience to the limit just to keep a 100-year-old machine and myself going for each of the 16 days. The Motorcycle Cannonball was established in 2010 in honour of Erwin “Cannonball” Baker, who set a world record for cross-country travel in 1914 by speeding from San Diego to New York City in just 11 days on a 7hp two-speed Indian motorbike. This year’s Century Race marks a significant era for American motorcycle history, prior to US involvement in WW1 and just after pioneer motoring. Harley-Davidson, in particular, supplied over 20,000 motorcycles to the US army to support war efforts during this period. 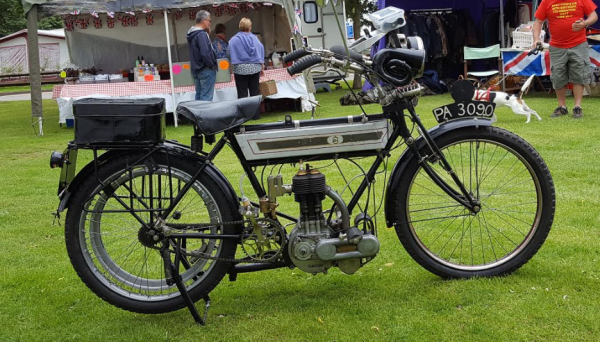 Additionally, Mike’s 1910 Triumph, was also used by the British Army in WW1 on dispatch missions, delivering vital communications to the frontline at far greater speed than had previously been possible. “We will be up against other machines that are far less capable and really quite delicate.